Home > Auction > Auction Service > New to Auctions? General - Know the auction scene. Auctions can be an exciting as well as a rewarding place to buy. A large mainstream London auction house such as London Coins will offer in each sale a wide variety of material most or all being "fresh" to the market, material that may not have surfaced for many years or which may never have been previously offered for sale. Lots will be sold to the highest bidder and pre-sale estimates will be no more than estimates, actual results may be much higher. Prices achieved on the day of the sale will dictate the market trends, and will be used to track price levels in the wider coin market. Price researchers study auction results. Mainstream numismatic auction houses including London Coins have a reputation for top quality attribution, authentication and impartial grading standards, they will have experts both permanent staff and consultant specialists in their field who have compiled the catalogues. 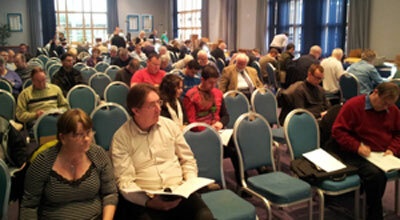 Most dealers and many serious collectors partake or closely follow the auction scene, do not be an exception. From a buyers standpoint the auction begins when the catalogue goes "live" generally 3 - 4 weeks before the sale. Clients with e-mail addresses will receive notification that the catalogue is on line including thousands of top quality images, covering most if not all of the individual (non – bulk) lots including paper money and medals. Postal catalogues will be sent a few days later containing the full listing of lots with selected images. The catalogue will contain a mix of individual items and "bulk" lots which may contain a few pieces or an entire collection. London Coins in the past have offered a single lot which contained over a million items. Viewing arrangements whereby potential buyers can physically examine the lots will be given in the catalogue. London coins as well as offering viewing facilities before the sale often travel the country with selected items by attendance at provincial shows. Our experts will be on hand for advice or further information. It is not essential to attend the auction in person to be a buyer. Bids can be submitted by fax, phone, email or post. Bidders will supply their maximum level and London Coins will execute this instruction at the sale, lots may be obtained for less than the maximum bid. Sale attendees who intend to bid can register when they arrive at the sale, venue details, viewing arrangements at the sale, and start times will vary from sale to sale but will be clearly laid out in the catalogue and on this web site. All who register will be given a paddle indicating their client number which can be held up whilst bidding and shown to the auctioneer if successful in winning the lot. All lots are available for clearance during the day of the sale, new clients may contact us prior to the sale for the current payment and clearance procedures. Proxy (non attendee) bidders if successful will receive an invoice a few days after the sale. An entire list of the hammer price realisations will be posted onto the web site shortly after the sale. All buyers should be aware a buyer's premium is added to the hammer price, details of which will be in the catalogue. London Coins web site has a, "what is it worth" feature on the web site where all sold lots since 2003 (tens of thousands) can be searched.